If you're looking for an incredibly easy and fun way to house train your pet then read on as I present here the best bell for dog training in 2017. When you have a new dog or puppy at home, housebreaking can turn out to be a huge issue. However, you can save your energy and time by training your dog to ring a bell when it's potty time. If you’re tired of hearing your dog bark and scratch when it’s time for potty, then this product could be an option to consider. It consists of two sets of extra loud bells (1.4 inches and sounds similar to sleigh bells) made from high quality metal and materials. The strap (almost 24 inches long) consists of quality nylon stitching, alloy ornament, and nickel plate bells. Besides, its charming design adds a look of welcoming character when it’s there on your entryway pull handles and door knobs. It’s available in five different colors and comes with a simple three step training e-guide. Despite being the Number one best seller on Amazon and hundreds of raving reviews, it has its share of unhappy customers. Some complain about the bells being not loud enough, while one customer said the dog’s nail got stuck while pawing at the bells. Others are unhappy that it’s tougher than advertised to train the dog to ring the bells. It’s the first bell I bought to train my Dalmatian puppy, and I personally give it a 4.5 star rating. It took just a couple of training sessions to get my dog familiar with ringing the bells when it’s time for potty. If you live in a regular size apartment or house, then you’ll have no trouble hearing the sound of these bells. I would highly recommend this product, if you’re looking to bridge the communication gap between you and your dog. Check out the second one on this list. 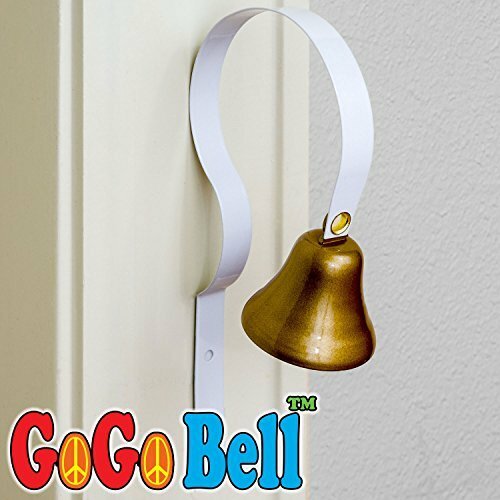 The next product on this list is the GoGo bell for housetraining. It comes handy when your dog wants to let you know that it’s time for nature call. With nearly 700 reviews and a 4.6 star rating on Amazon, find out more about it below. The bell (1.5 inches) is made out of solid metal, and comes with a metal attachment (about 6.5 inches). There are no slots or too many bells, but a standard bell that chimes when your dog paws or noses it. It’s unique in comparison to most other bell products available for dog training. There’s no chance of your dog’s claws getting stuck, as there are no open slots. The company also offers a full refund if your dog can’t train to ring the bell or if the bell breaks. Some customers complain the bell’s metal quality is not up to the mark as older and rambunctious dogs can easily break it apart. While others said they got no screws in the package to fix the bell hanging. Although, it could be a one-off incident. Small breed dog owners (eg: toy poodles) say that their dogs are afraid of the loud sound the bell makes. Some meaningfully point out this product misses the mobility factor, as it can’t be carried everywhere they go with the dog (like a hotel during a vacation). Taking all these factors into view, the GoGo bell for dog training is still a good product that you could consider (with over 80% - 5 star reviews on Amazon). It ensures your dog is safe while ringing the bell due to its conventional design without any slots. 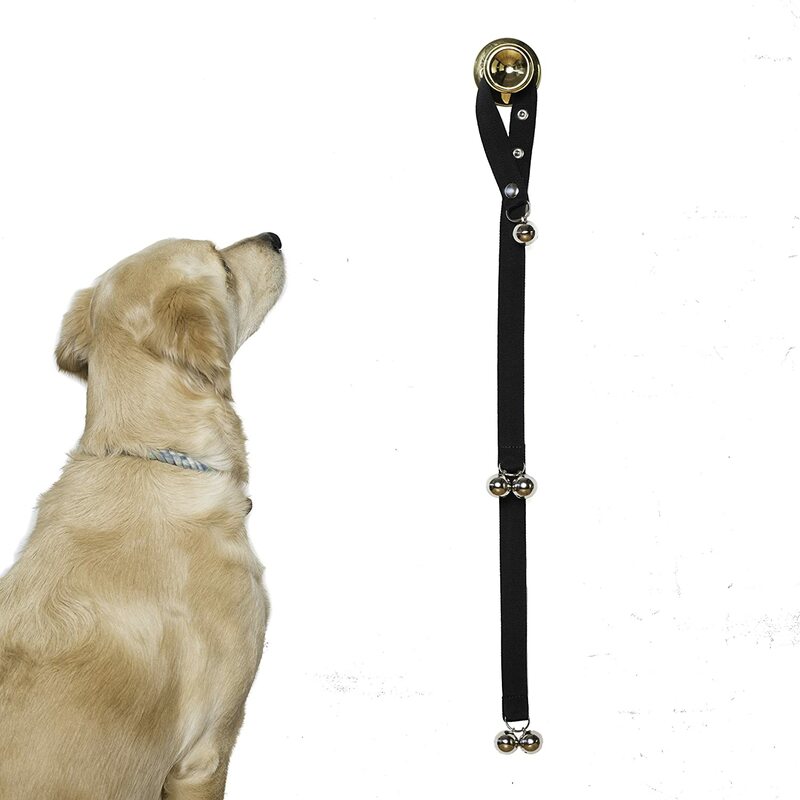 It is easy to install, comes in the perfect size, and it could be a cinch to train your dog with this bell. So I give it a 4.5 star rating. Read on to find out about the third one on our list. The company claims this product offers a simple yet efficient way to train your dog or puppy in five easy steps using their guide. 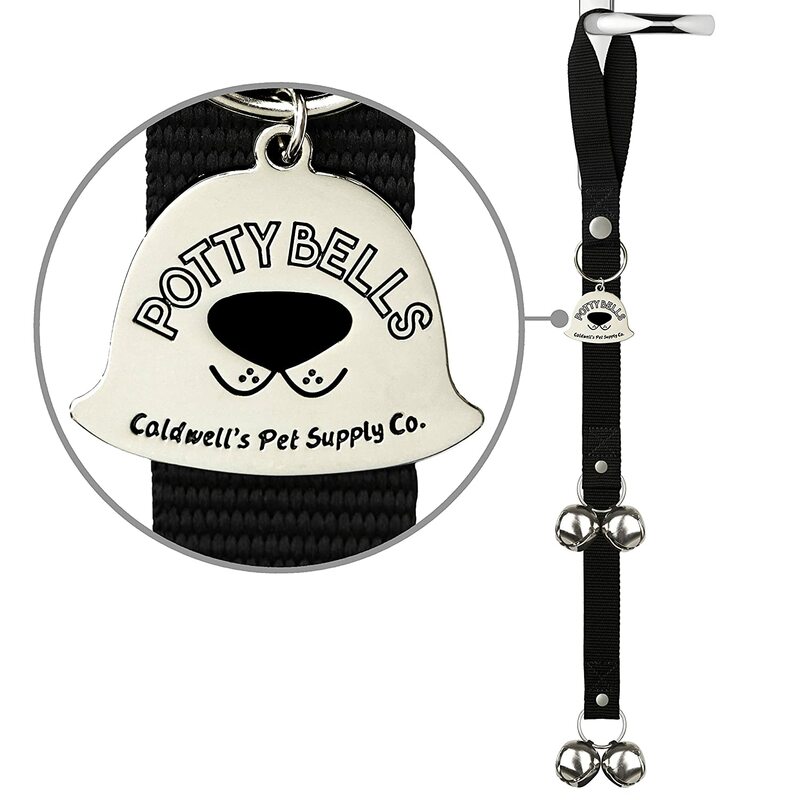 It consists of two sets (3 below & 2 up) of good quality chrome coated bells on a soft nylon strap. It also comes with a button clip to do height adjustments, so you can place it according to the height of your pet. You can just hang it on the door and train your dog to ring the bell when nature calls. Most customers are happy with the fact the bells are quality stuff and loud enough to hear the sound. In addition, it’s available in four different colors. There were a few downsides that customers point out. Some say it’s too lightweight, while others said it doesn’t suit older dogs over five years, as they are less inclined to ring a bell. A few said a couple of bells came off after a few days usage. Although the downsides could be individual incidents, most customers have great things to say about the product. In short, it can be a product to consider to train your dog, because you don’t have to clean the mess every six hours at your home. I give it a 4.5 star rating. Check out the next one on our list below. Potty Training Bells from Banjo’s Box is the fourth product on my list. It has a 4.8 star rating with over 200 reviews on Amazon. It aims at helping both older dogs and newborn puppies train in good house manners. Read on further to find out what makes it special. It comes with five premium double thickness bells. So when your dog noses or paws it, the sound is loud. In addition, the bells are there on a chew-proof nylon strap. The good news is the strap is adjustable (24-30 inches). So whether you need to train a puppy or a older dog, it becomes easy and adaptable. It also comes with a step-by-step training guide. This way, you can teach your dog quickly and efficiently to use the bells when it’s time to go out. Although this product has nearly 90% 5 star reviews, a few customers found some issues. Some say that their dogs simply won’t use the bells, as they are sensitive to the loud bell sounds. While others say the price tag for this product is not cost effective in comparison to its purpose. I would recommend this product, as it serves as a substitute to whining and barking when your dog wants to go out for nature calls. It comes with a durable strap and bells to signal you instantly. And, its adjustable length helps to train your puppy or a large breed dog efficiently. All the bell products on my list serve the primary purpose of training your dog. They are indeed safe to use and consist of quality materials. However, my best two choices would be the Primal Pet Gear bells and the Potty Training Bells from Banjo’s Box. They both look almost similar and offer identical features. However, the winner for me is the Primal Pet Gear bells. It’s easy to use and train your pet, and it costs less in comparison to the other one. When you’re on the lookout for a dog’s bell, ensure it’s not too noisy and heavy for your pet. On the other hand, if you can't hear the bells when your dog rings, then there's no point in buying it. Ensure the height of the bell is adjustable. This way, you can train your grown up dog or puppy with ease. Also, it’s helpful for long term when your puppy continues to grow up. Bridge the communication gap between your dog and you by choosing a bell for training. 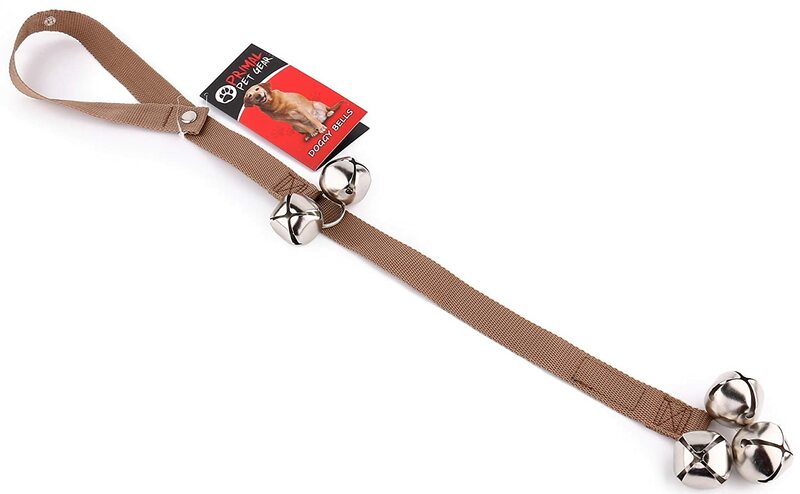 You can consider Primal Pet Gear Bells, as it’s affordable and easy to train your dog when it’s time to go for potty. You can now avoid accidents and housebreaking in no time.